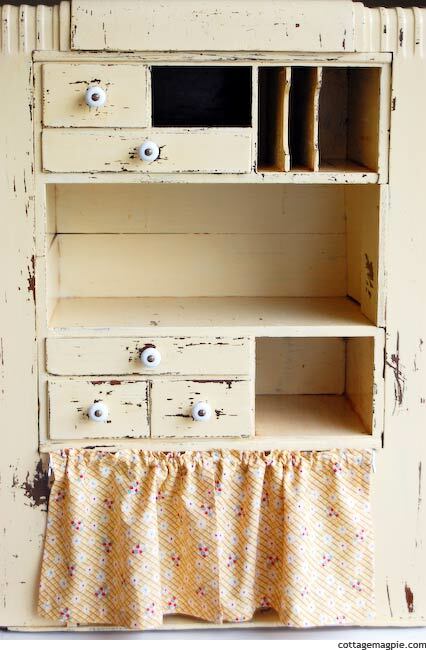 I know you've probably been wondering what cabinet it was I've been doing all these projects on! The cabinet access hole, thenlittle mini curtain... clearly I am up to something. After I got discouraged about the someday mud room, I started working on my workshop (aka office / craft room), and I kind of got on a roll. I decided to just focus on one small area and go from there, so I'm working on the back wall where Mr. Magpie put the built-in cabinets and wainscoting. The first thing I did was hang a gallery of plates, and then I started working on this little cabinet for storage. 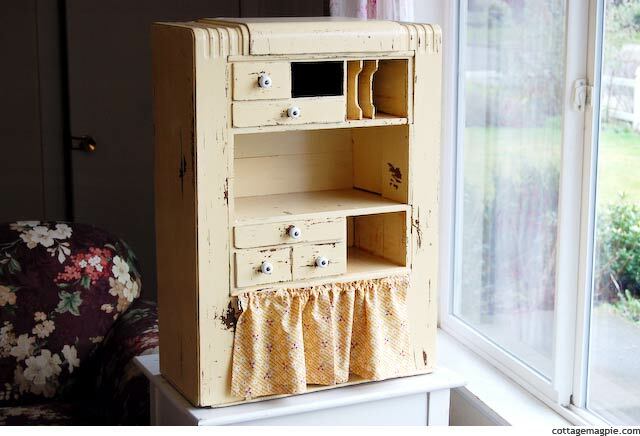 A couple of summers ago I found this cute little cabinet at a yard sale around the corner. I can't remember what I paid for it, maybe $10? 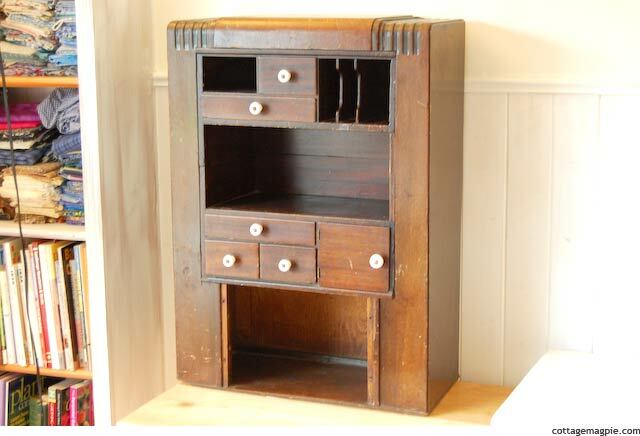 Mr. Magpie said it looked like an old radio cabinet, and I said I couldn't possibly be with all those drawers and mail slots. Guess what? We were both right. I found a sticker inside saying that it's a radio, but all the mail slots and drawers were added later because they are a different kind of wood and have screws and things in them. Plus... way wonky! It kicked around the house for a couple of years, waiting to be made over. This last week, it finally hit the top of the list. Read on to see the transformation! This is what it looked like before I started working on it. 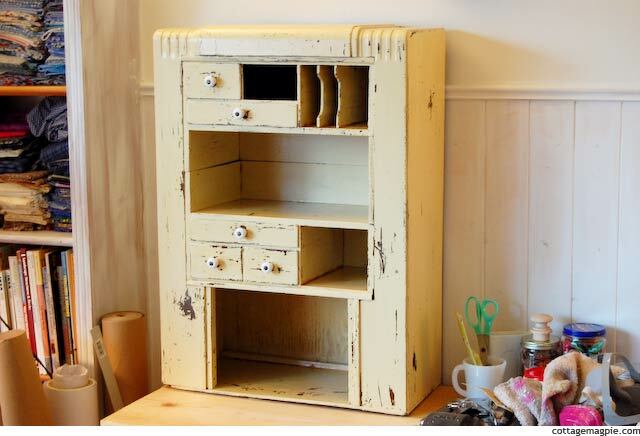 First I put a coat of pale yellow paint on it. It's flat Martha Stewart oops paint I had picked up somewhere for a few bucks a few years ago and have been hoarding... um, I mean storing... in the garage. I didn't prime or anything, and I didn't sand either. I just slapped the paint on. I knew I was going to be distressing, so I wanted to leave as much texture as possible. I put a second coat on as soon as the first one was dry, and as soon as it was dry, I started banging the paint up a bit. I usually use a paint scraper for this, but you can use anything handy. The paint is usually pretty soft, so it scrapes very easily. I did this one right away, but on the green cabinets in the family room, I did those the next day. After it dried more thoroughly I put a coat of poly on it and put the handles back on. Then I did the access hole and made the little curtain, and she was done! For more information on the hole and curtain, you can see the tutorials "How to Drill a Cabinet Access Hole" and "How to Hang Small Curtains for Cheap." All in all, I'm very happy with it! I think it's cute and it makes me happy every time I walk in this room. I couldn't help but take a slew of pictures. Now I'm storing all my little notions and things in it. Jars of pins and buttons, stapler, scissors, extra thread, that sort of thing. I can't believe I didn't do this project sooner!! How about you? Do you have any projects kicking around that you've been wanting to get to?